Physical activity is any bodily movement that results in energy expenditure. Everyone needs to be active each day to maintain a healthy lifestyle. It is great for your body and your mind. What does this mean? Get up! Move! Physical activity can be done anywhere, anytime, and requires no special clothes or equipment. It can be sport and recreation, gardening, farming, housework, cycling, walking from home to town or even a physical job that has you moving a lot. Physical activity releases many endorphins (natural chemicals that make you feel good) so Physical Activity is not just great for your body, but also for your mind. So if you are not being active enough, your risk of the above conditions is much higher. Enjoy the beauty of Fiji by getting out and experiencing it! Even these small increases in physical activity can produce health benefits. It is recommended that you should sit for no more than two hours at a time. Tucake…Toso…every two hours! Sitting for more than 6 hours out of your day increases your chances of dying 15 years early by 40% compared to those that only sit 3 hours out of the day. Types of Exercise To get the right balance of exercise, there are 3 different types you should be aiming to do. 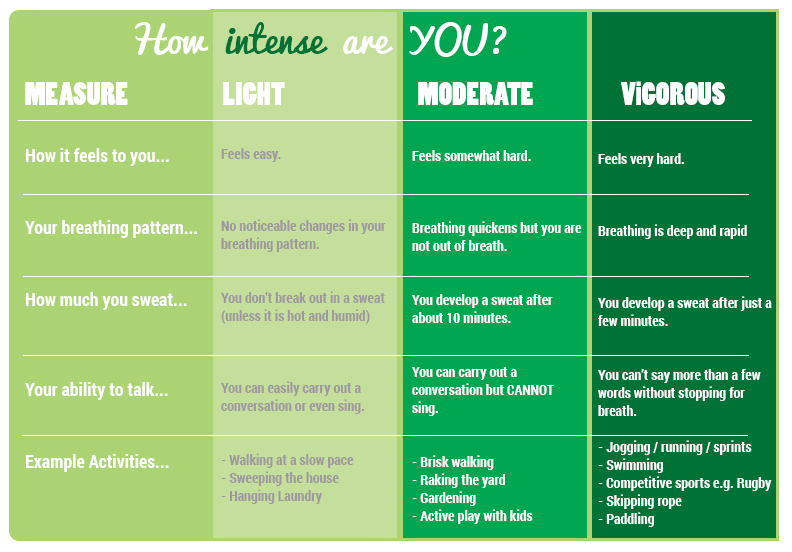 There are 3 levels of intensity when it comes to aerobic exercise. Range of motion in joints. Stretching activities help improve flexibility, allowing muscles and joints to bend and move easily through their full range of motion. Examples of Flexibility Activities Yoga, Splits, Cartwheels, Jungle gym, Monkey bars, Karate, Pilates, Tai-chi GUIDELINES Fiji has a set of guidelines in place for how much physical activity you should be doing at every age for healthy living. No matter how old or young you are, every person should be exercising daily. Guideline 1: MOVE MORE! 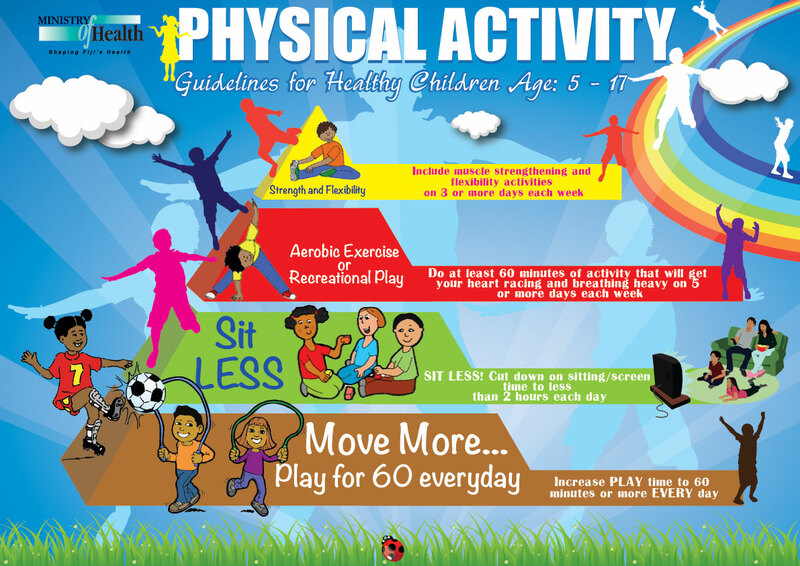 Increase PLAY time to 60 minutes or more EVERY day! Guideline 2: SIT LESS! Cut down on sitting time to less than two hours each day. Such as watching TV, playing video games, sitting in class, internet usage. Guideline 3: Do at least 60 minutes of activities that will get your heart racing and breathing heavy (moderate – vigorous) on 5 or more days each week. Such as aerobic exercises or recreational activities -He/Tag, Playing Pani, swimming, skipping rope, hopscotch, brisk walking, dancing. Guideline 4: Include muscle strengthening and flexibility activities on 3 or more days each week. Such as strength and flexibility- Jungle gym, monkey bars, tree climbing, pushups, pull-ups, karate. The guidelines for adults are pretty simple, if you follow these rules, you are sure to be getting enough exercise. Remember, if you exercise more, you will encourage your children to exercise more, set a good example. Guideline 1: If you are not physically active (moving much) it’s not too late to start now! Do regular physical activity and reduce sedentary (sitting) activities. Guideline 2: BE ACTIVE EVERYDAY in as many ways as you can!. Guideline 3: Do at least 30 minutes of MODERATE INTENSITY activity on 5 or more days each week. Guideline 4: If you can, enjoy some regular VIGOROUS INTENSITY activity for extra health and fitness benefits. Older adults should try to follow National Guidelines for Adults (18-64) and modify according to their level of ability. Exercise for Older People Older people should especially try and include everyday activities to improve their muscle and bone strength such as carrying shopping, climbing the stairs and gardening. You should also aim to do activities that maintain your balance, strength, and flexibility such as bowling, swimming, yoga, tai chi, walking and/or stretching. With age our bones weaken and we naturally become less balanced so it is very important to continue to work your muscles and your mind in order to maintain balance and strength. If you do not work your muscles, including the brain, than they will more quickly deteriorate or get weaker. Whatever your ability is, work within it and always be safe. If unsure about whether you can do something, consult with your local physiotherapist or be sure to bring a family member along when you first try it. *Golden Rule – Move as Much as You Can, As Often As You Can, Within Your Ability!